Tectonic geomorphology is the study of the interplay between tectonic and surface processes that shape the landscape in regions of active deformation and at time scales ranging from days to millions of years. Over the past decade, recent advances in the quantification of both rates and the physical basis of tectonic and surface processes have underpinned an explosion of new research in the field of tectonic geomorphology. Modern tectonic geomorphology is an exceptionally integrative field that utilizes techniques and data derived from studies of geomorphology, seismology, geochronology, structure, geodesy, stratigraphy, meteorology and Quaternary science. 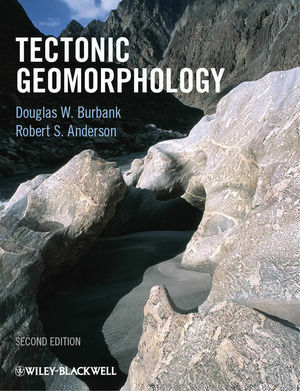 While integrating new insights and highlighting controversies from the ten years of research since the 1st edition, this 2nd edition of Tectonic Geomorphology reviews the fundamentals of the subject, including the nature of faulting and folding, the creation and use of geomorphic markers for tracing deformation, chronological techniques that are used to date events and quantify rates, geodetic techniques for defining recent deformation, and paleoseismologic approaches to calibrate past deformation. Additional resources for this book can be found at: www.wiley.com/go/burbank/geomorphology.